Following in the footsteps of hyped collaborations with A-COLD-WALL* and Off-White™, Nike‘s Air Force 1 Low is now set for another attention-grabbing look in floral print. This version of the low-top classic features a black color base and an all-over floral print textile upper. The multicolor pattern is framed with black tooling via the leather lace trim, lacing system, mesh lining and rubber cupsole, as well as a black leather Swoosh that’s outlined with contrast yellow stitching. Other details include embroidered Nike branding at the heel counter, a blocked-out yellow Nike Swoosh logo at the tongue and insoles, and another vibrant hit of yellow at the sole unit accent. 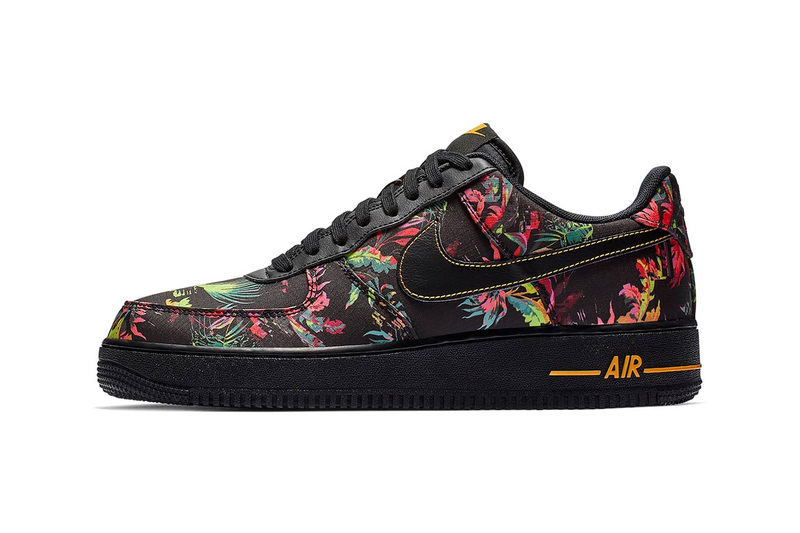 The Nike Air Force 1 Low floral print colorway is scheduled to release on January 1, 2019 at Nike’s web store and select retailers. For more upcoming releases, take a first look at the BAPE x NEIGHBORHOOD x adidas POD-S3.1 model. Patent leather takes center stage. Utility vests, vintage tees, chest packs and more. Originally designed by Geoff McFetridge. Another collaboration in the pipeline.